Criss Angel pushes it to the limit, lying on glass and having a steamroller roll over him. Submitted by monkey on Wed, 06/20/2007 - 12:00pm. Criss Angel levitates above the Luxor Hotel in Las Vegas. Submitted by monkey on Tue, 06/12/2007 - 7:50am. 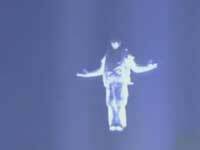 Some old footage Criss Angel doing some awesome illusions. Submitted by monkey on Mon, 03/19/2007 - 1:43am. Criss Angel does crazy magic in a grocery store. Submitted by monkey on Wed, 11/29/2006 - 3:28am. Submitted by monkey on Fri, 08/18/2006 - 1:37am. Submitted by monkey on Fri, 07/21/2006 - 3:11am. Submitted by monkey on Tue, 07/04/2006 - 4:37am. Submitted by monkey on Tue, 07/04/2006 - 4:08am. Submitted by monkey on Tue, 07/04/2006 - 3:43am. Submitted by monkey on Tue, 07/04/2006 - 3:37am.